Charles van Sandwyk was born in Johannesburg, South Africa, in 1966. He moved to Canada in 1977, and his family settled in Vancouver, British Columbia. Van Sandwyk is a writer, illustrator, and artist. He attended Capilano College. Van Sandwyk won an Alcan Award for his first book, A Selection of Neighbourly Birds in 1986, and his book Wee Folk won the Jurors Choice Award at the Seattle Book Fair in 1994. Charles van Sandwyk currently resides both in North Vancouver, British Columbia, and Fiji. 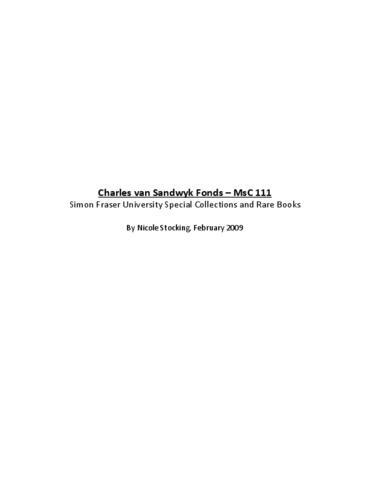 Fonds primarily contains examples of art created by Charles van Sandwyk from 1987-2005. The art includes prints, ephemera from books published by van Sandwyk, and ephemera from art exhibitions. Also included is biographical items about van Sandwyk, and two photographs of the artist. The material is arranged based on the type of material and, when applicable, the book for which the art was created. The fonds is divided into five series: Series 1. Biographical Items, Series 2. Books, Series 3. Promotional Materials, Series 4. Book Ephemera, Series 5. Art Ephemera.